Presenters: Ally Samuell (Sierra Club RF100) and Junior Romero (Food & Water Watch). ALLY SAMUELL DESCRIBED SIERRA CLUB RF100. She recommended reading step 1 thru 3 in “Ready for 100 Organizing Toolkit”. Participants are expected to abide by the “RF100 Campaign Principles” . Ally also invited all to attend a nation-wide training webinar, which she will hold the end of October (date to be announced). 85 cities are now committed to 100% clean energy. Goals are 100% electricity by 2035, and 100% heating/transportation by 2050. Cities have various ways of enforcing/codifying, such as adding a 100% renewable energy chapter to the city Energy Master Plan or Climate Action Plan. Ally recommended a book “Energy Democracy: Advancing Equity in Clean Energy Solutions”, edited by Fairchild. Norman, Oklahoma, was successful in communicating about businesses which adopted 100% renewable energy by highlighting/praising them, via community and social media, window stickers, etc. We could use these concepts to help the Middletown Green Team promote the “Direct Install” energy efficiency for businesses. (We distributed the Green Team residential and business energy efficiency flyers at our Sept 22 booth). Jan Dash observed that numerous country-wide and world-wide supporting changes are needed to support climate change goals. Climate change was listed #14, following these supporting changes, in 20 “Development” goals, documented in “Sustainable Development: Managing and Protecting Our Common Environment” from the 2005 World Summit Outcome. REPORT BY JUNIOR ROMERO on success of New Brunswick’s drive to 100% renewable energy. NEW BRUNSWICK: Population is 57,000 (compared to 67,000 in Middletown, 31,000 in Long Branch, and 12,000 in Red Bank). New Brunswick and Long Branch both operate under the Faulkner Act; proposed ordinances can be introduced by a petition signed by 10% of the registered voters who turned out in the last General Assembly election in an odd-numbered year. Once the petition is submitted, the local governing body can vote to pass the requested ordinance; if the governing body does not pass the ordinance, the petition is then directly voted in the next election. DESCRIPTION: Electrical Aggregation is like going to CostCo and buying electricity in bulk. Many NJ towns already have an aggregation for fossil-fuel electricity; that aggregation can easily be switched to increasing percentages of renewable electricity. The New Brunswick petition signed by ~800 New Brunswick residents. 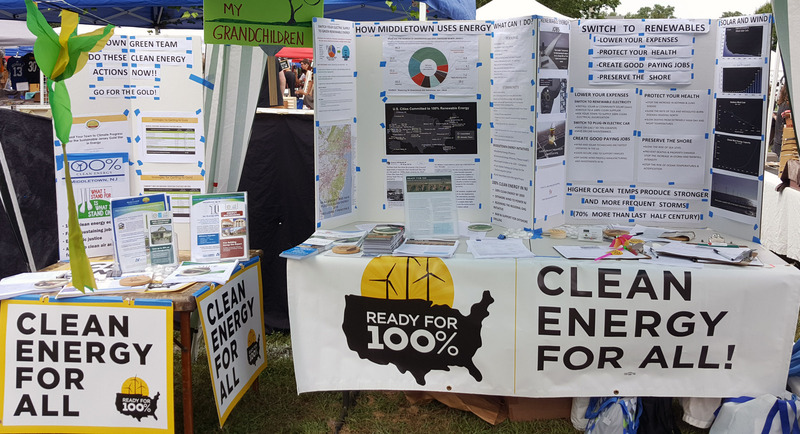 OTHER: A Middletown table top exhibit (about 10 linear feet of tri-fold poster board + flyers) was displayed at the “Monmouth County for Clean Energy” march/rally in Red Bank on Sept 8, and displayed at the “Middletown for Clean Energy” booth during the Sept 22 Middletown Day. Annette Benanti plans to modify the Middletown table top exhibit to highlight “Long Branch for Clean Energy” during upcoming Long Branch events. The Middletown table top exhibit is available for loan for additional activities and by other cities as requested (contact stevemiller@comcast.net). A script is available for use in describing the table exhibit. 2:15 school day (TBD): meet with Middletown Schools to discuss energy. The schools are receiving awards from Sustainable Jersey Schools program, and are installing solar on most school roofs. Dec 4 "Climate Reality: 24 Hours of Reality" house viewing party.